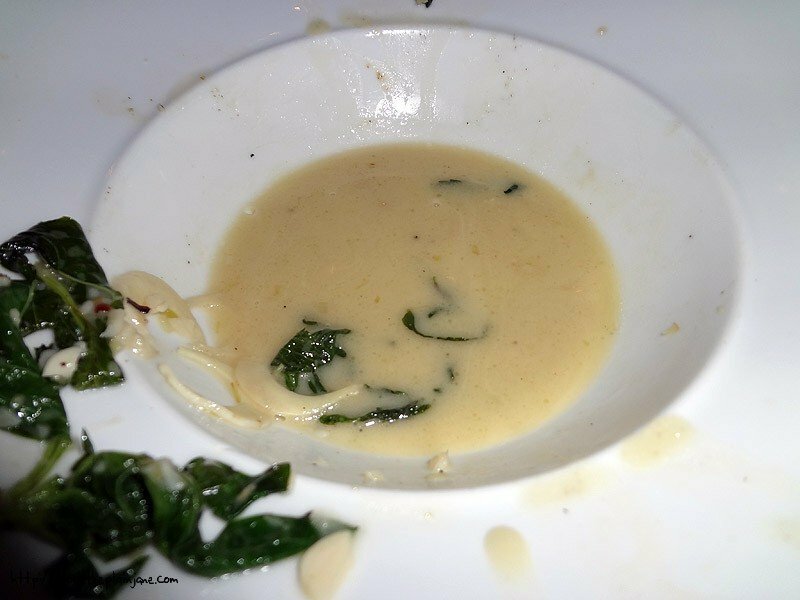 I was recently invited to Anthology to try out their newest menu items by Chef Todd Allison. I’d always been interested in going to see a show at Anthology. This proved to be a stellar way to try out some new eats and to catch a show all in one. Anthology is set up with three different levels – the main floor near the stage, a second level with just a few booths, and a top level. There’s also an upper level GA admission area with no view of the stage and monitors instead. Laura and I arrived well in advance of the crowd and snagged some nice seats up front on the floor, near the stage. Getting there early was nice since we were able to chat and eat most of our food before the show began. The waiters are pretty good about letting you have your space when the show begins and only come by to check on you when necessary. 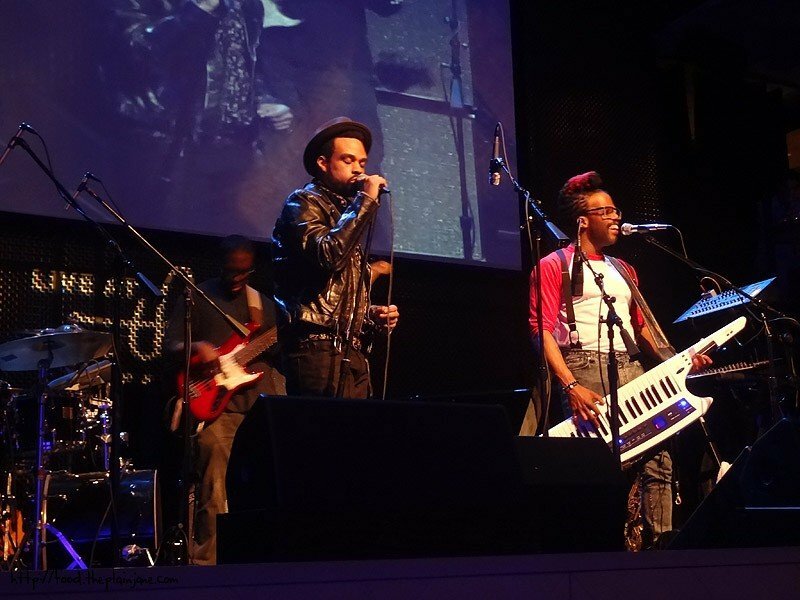 I had picked a date arbitrarily and we ended up seeing a band called the Robert Glasper Experiment – a mixture of jazz, soul and a little hip hop all thrown into the mix. I can honestly say it was like nothing else I had heard before with the mixtures of genres all rolled into one. It didn’t quite make me a new convert, but I enjoyed seeing them and experiencing something new. I’ll leave the music reviews to others. We started off with these steamed black mussels, which our waiter told us were locally grown from Carlsbad. I had never had mussels before, but I was feeling adventurous – and I’m glad I was because I ended really liking these! The flavors of the ginger, mint and basil all showed through giving them a really deep and wonderful flavor. The mussels reminded me of oversized clams – similar texture with a nice, sweet flavor. We were given a bowl to discard the shells and I’m glad we had a lot of additional bread. These were the rolls we were given at first and we used this for one particular purpose. To sop up all of the leftover sauce/broth the mussels were in! 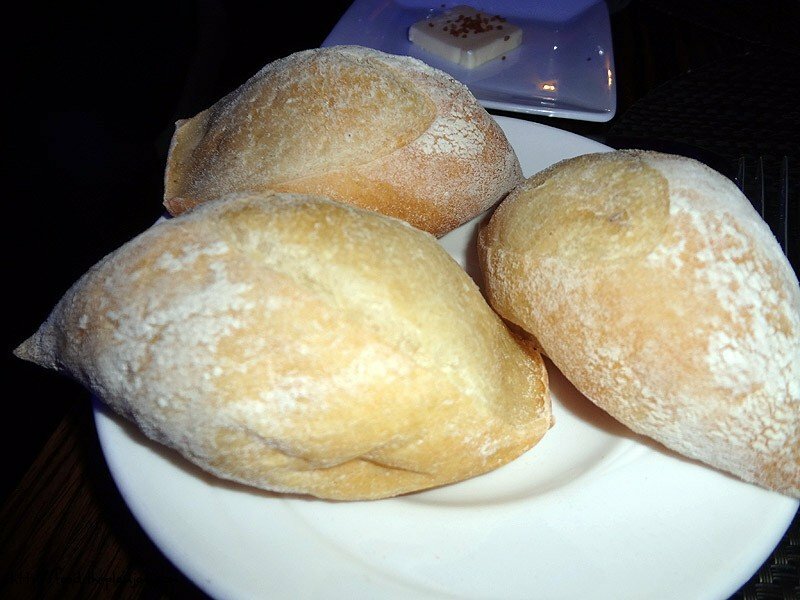 It was so rich and flavorful and tasted really great with the bread. We continued the seafood conquest with an order of calamari. We got the tentacle parts in addition to the rings – which doesn’t bother me one bit. This calamari was very lightly breaded – almost just a dusting – and really helped to make the calamari shine through. Perfectly done, too. The tentacles were nice and crisp and the little cup of lemongrass aioli was a nice, bright sauce to go along with it (versus the traditional marinara most places give you for your calamari dipping sauce). 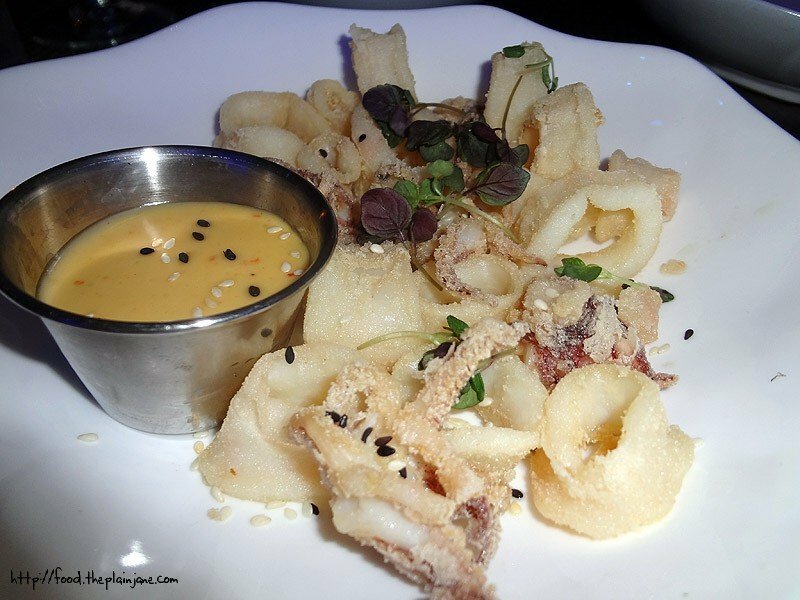 I really enjoyed the sauce – it was sort of sweet and crisp and complimented the calamari very well. Ah, this one. This was the downer for me that night. 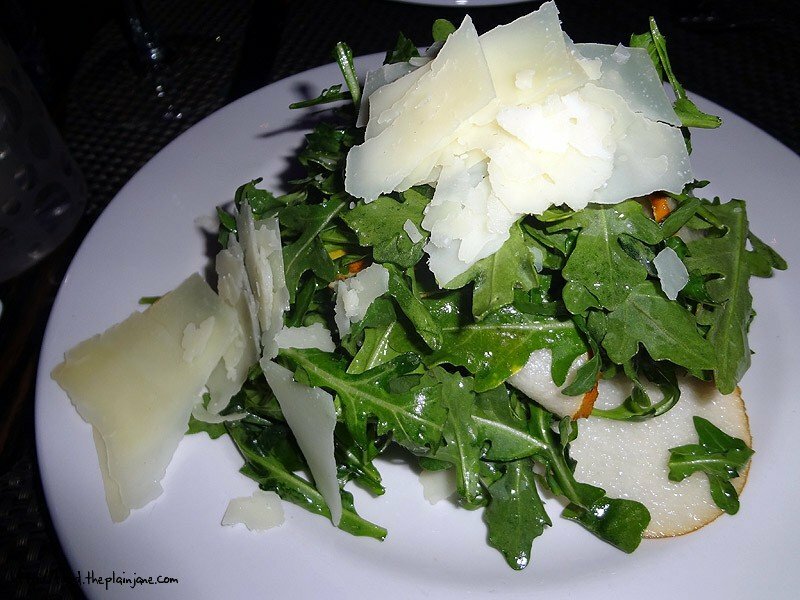 This was the night I discovered that I don’t really like arugula all that much. We ordered this since it was recommended, but I thought it would still have other greens in it besides arugula. Having it be *all* arugula was too much for me personally – it was just too bitter for my tastes. I ended up just eating the cheese and pears and ignoring the rest of the arugula. I even did that thing you do when you move stuff around on a plate to make it look like you ate it. I’m pretty sure I didn’t fool anyone. Laura and I both got the same entree – the Lamb Chops. 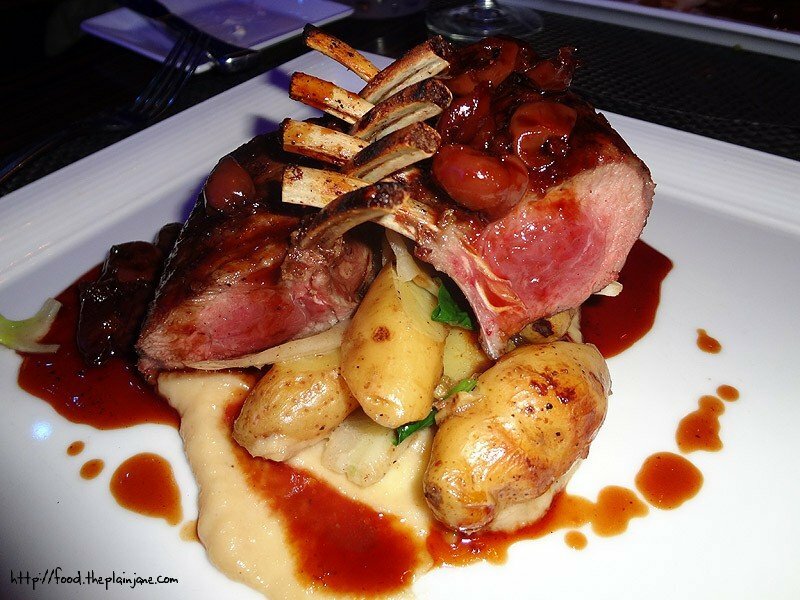 The sauce makes the dish looks really strange and bloody… but really it’s just cherry demi-glace! I was also surprised that I liked the cherry demi-glace – I’m not a big fan of cherries but the flavor was just right. Out of curiosity I ate a cherry and found that nope, I still didn’t actually like eating the cherry itself. We waited a bit after eating and towards the end of the show to order dessert. 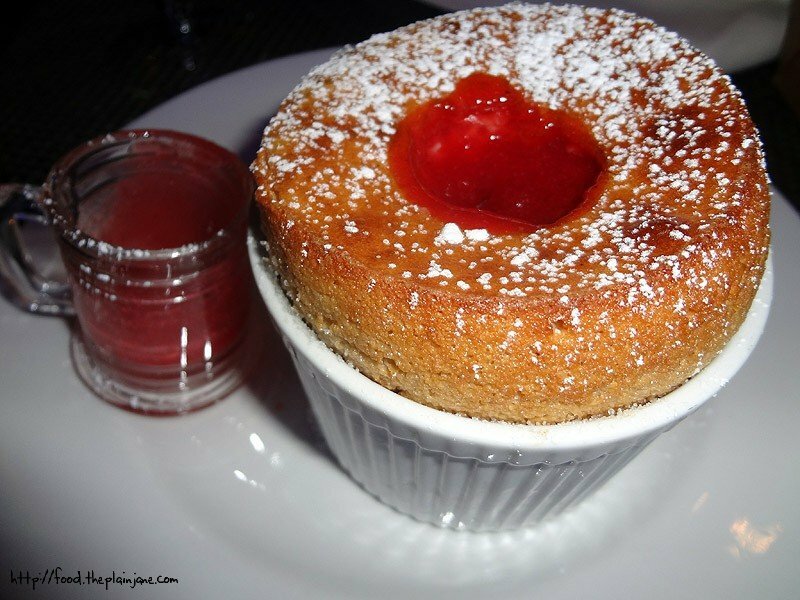 The most unusual and interesting sounding dessert to me was the PB&J Souffle. When it came to our table, the server poked a hole in the top and then poured the berry coulis into the middle, giving it the “J” part of the dessert. 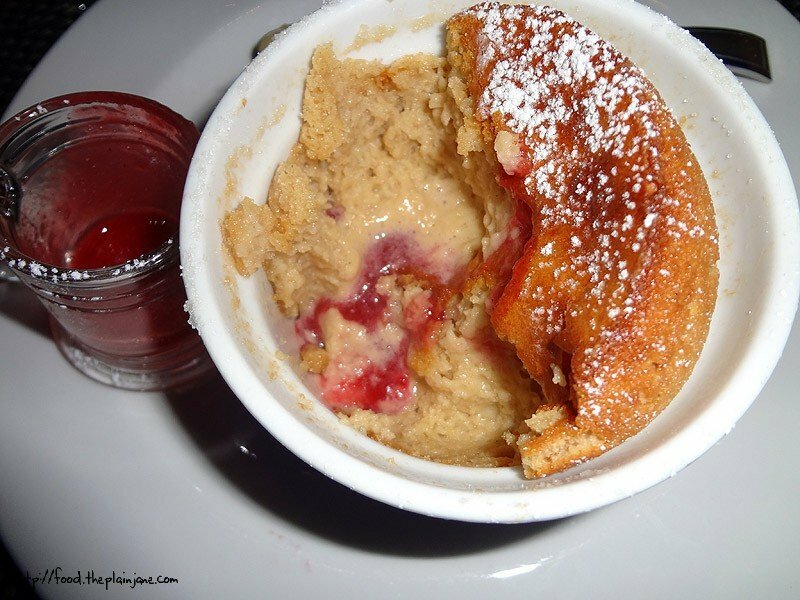 It was fresh out of the oven and the peanut butter part was really nice – but the berry coulis gave it a little extra added sweetness that complimented the dessert really nicely. While not my favorite PB dessert ever, I did still enjoy it. I always love trying new things – especially new desserts! Disclaimer: I was invited to Anthology for a complimentary meal and complimentary show tickets. Thanks for Olive PR Solutions for inviting me! I was not paid for this review and all opinions are my own. 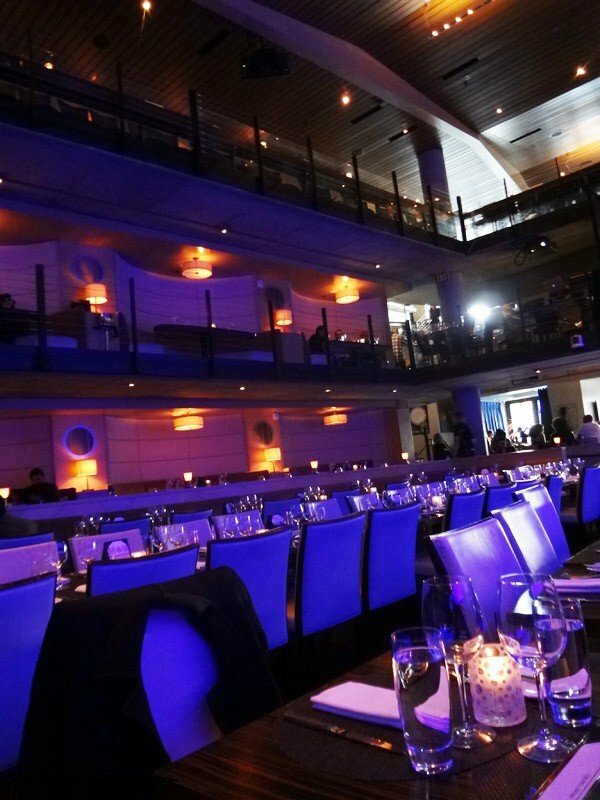 We used to go to Anthology a lot – it was a fun way to do dinner and a “show”. I’m glad to see their food is still tasty. I would have been intrigued by that PB&J souffle. It sounds so good! It was a good time! 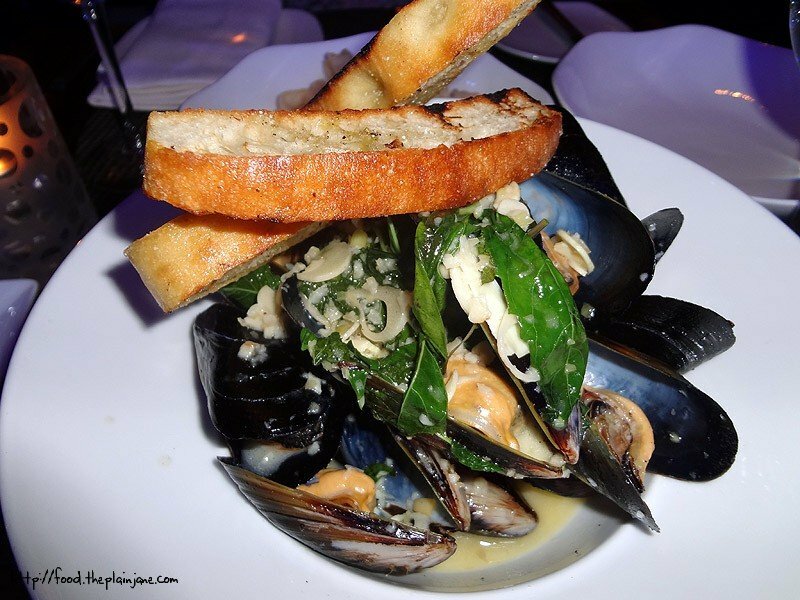 I’d like to go again sometime – even if just to have some more of those mussels!